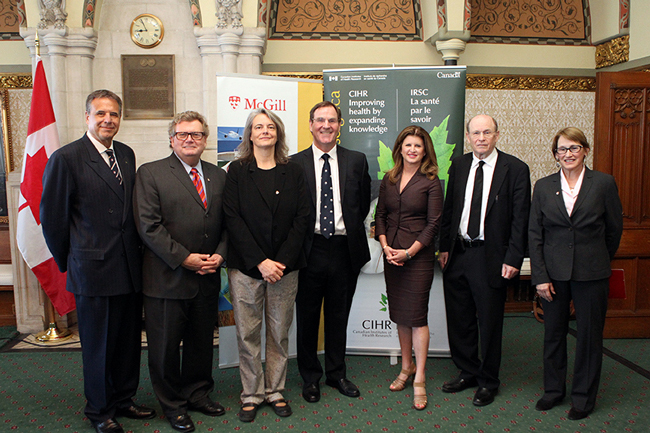 Five of McGill’s most distinguished researchers were honoured yesterday on Parliament Hill for their contributions to health sciences research in Canada and internationally at an event hosted by the Minister of Health, the Honourable Rona Ambrose. Professors Alan Evans, Brigitte Kieffer, Nahum Sonenberg and, in absentia, Brenda Milner and Michael Meaney were presented with certificates of merit for their pioneering and cutting edge work in basic biology, brain imaging, psychiatry, and learning and memory. Five of McGill’s most distinguished researchers were honoured yesterday on Parliament Hill for their contributions to health sciences research in Canada and internationally at an event hosted by the Minister of Health, the Honourable Rona Ambrose, and jointly organized by the Canadian Institutes of Health Research and McGill. Professors Alan Evans (The Margolese National Brain Prize), Brigitte Kieffer (L’Oreal Women in Science Award), Nahum Sonenberg (The Wolf Prize) and, in absentia, Brenda Milner (Kavli Prize, Dan David Prize) and Michael Meaney (Klaus J. Jacobs Research Prize) were presented with certificates of merit for their pioneering and cutting edge work in basic biology, brain imaging, psychiatry, and learning and memory. Among the guests present for the event were members of Parliament, including Minister of State (Science and Technology) Ed Holder, and members of the Canadian Senate, as well as representatives of the Canadian Institutes of Health Research, including Alain Beaudet, President. From McGill, Professor Suzanne Fortier and VP (Research and International Relations) Rosie Goldstein attended the event, along with a delegation of McGill health sciences researchers. Prof. Fortier expressed her appreciation to Minister Ambrose and emphasized the value of the contributions of the Government of Canada and CIHR to the advancement of science and knowledge. Professors Evans, Kieffer and Sonenberg echoed Dr. Milner’s message, sharing anecdotes from their own research careers which illustrated how basic scientific research has paved the way for some of the major discoveries of our time, including the polio vaccine and ongoing development of antidepressant and pain management medications.